Since 1921, people have come into our door expecting to find a wide variety of beautiful floor coverings. They keep coming back because of the service they receive. When you visit our store, you’ll find the leading names in floor covering but most importantly, you’ll find honest advice from our sales people. We will ask where you live, about your lifestyle and how many people are in your family. Because we understand that you’re not just looking for floor covering – you’re looking to enhance the value of your home and the quality of your life. Why start the new year with new carpet? Carpet is the one floor covering that does it all. It adds comfort to your home because it's softer to walk on, sit on and play on. Carpet adds warmth - both literal and as an additional insulator. Carpet quiets your home by soaking up the noise of a busy family. And it's stylish with its many options of texture, pattern and color. 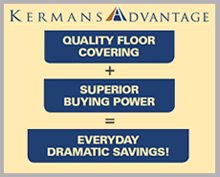 Learn more about your carpet options with Kermans Carpet Buyer's Guide. Go ahead, stop by Kermans Flooring on Indianapolis’ northside. Talk to our people. Do some price shopping. We think you’ll be pleasantly surprised that the service and quality you've always heard about comes with a price tag that is very affordable. You simply won’t find this service and value for new carpet anywhere else in Indy. That is the Kermans Advantage.